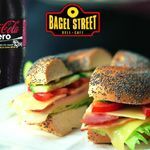 This London Bridge location of the popular Bagel Street chain is an impressive one, boasting a good selection of quality bagels and other snacks. Do you work at Bagel Street? What did you think of Bagel Street? Bagel Street is a cracking place to grab some lunch. I've never really liked the sound of bagels but I tried a salmon and soft cheese one and my tastebuds were blown away! If you haven't tried Bagel Street yet, this is the best one in London.